My class’s Friday book/film club is adorable and is the perfect excuse to bake every Thursday night if not being lazy. The National Gallery is an underrated treasure here in London. Another underrated food is caramelised banana. Learning is the right balance of acceptance and curiosity. The bright and vivid, dark ink of a new pen is almost orgasmic. I picked at a mostly dry stack of buckwheat pancakes the other Saturday and am now afraid of ordering pancakes or waffles somewhere ever again. 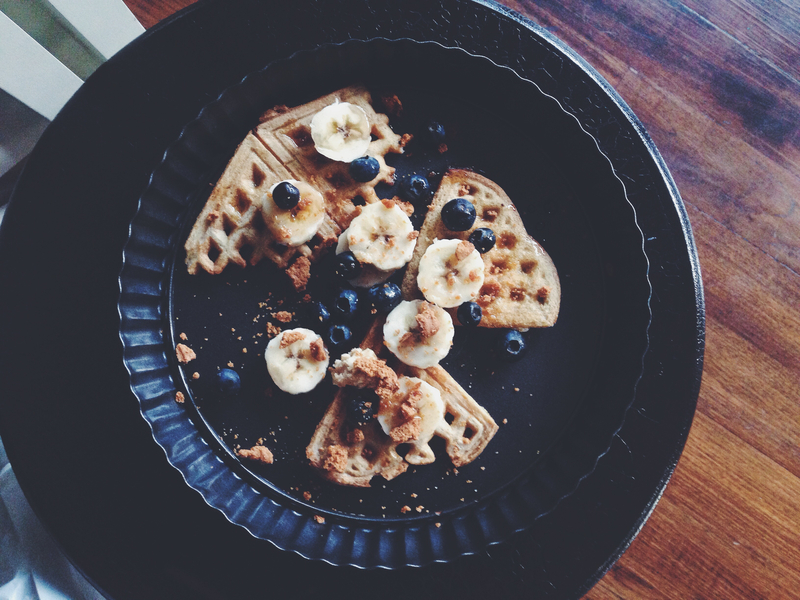 Today’s post is thus born out of a love for the neglected kitchen, a strong tribute to the homemakers of the century– who needs waffles outside when you can make amazing ones within the warm comfort of your home, to accompany a freshly brewed Nespresso cuppa, a book or probing documentary, and mountains of whatever toppings you would like? Now that the first huge set of assignments are done, I’m relaxing with my waffles, already on my second cup of coffee. As I type, some doughnuts hibernate behind me. A free Wednesday is therapeutic and needed, sometimes. I think I spend all my money on flour and nothing else. Flour, frozen berries, bread and veggies. Those top the list. What else is required for a happy life; what else is needed to dedicate concentration to the hours that don’t make up breakfast, lunch and dinner? These waffles. They’re thick. They burst and bubble with specks of chocolate, all crisp round the edges and mildly chewy everywhere else. The rims and ridges are sharp and taut, ravines ready to catch your lashings of maple syrup (didn’t have any syrup this time sadly, so used blackstrap molasses which did the trick anyway). You probably can’t tell, but the first picture shows a plain version, the second is chocolate chip-stuffed. Depending on your mood, make either, but at your own caution, for chocolate, melting and caught between each crevice, really makes all the difference. Tip all ingredients into a bowl and mix until all is well combined. The mixture should be like a thick cake batter; add more flour if it isn’t. You could do this the night before and pop the bowl into your fridge so you save a little time in the morning when you make it! Preheat your waffle iron according to its instructions, grease with whatever fat you used in the batter itself (in this case I used coconut oil) and pour the batter in, making sure not to exceed the tips of the iron ridges. Cook until the surfaces are lightly browned. My waffle iron doesn’t require me to flip the waffles over, but if you feel the heating is uneven, go ahead and do just that after 3-4 minutes, depending on how fast and strong your iron is. This recipe makes about 2 thick waffles, a generous serving for one person, but sharing with someone else works too. Freeze any extras and toast in your toaster when you want to have them again. Soooo good with thick and creamy soy yoghurt, berries, caramelised banana (see above) and maple syrup. I had the pleasure of being interviewed earlier on in the week by the lovely Rachel Loh, the name behind lifestyle blog Willow. Working on the theme of disconnection, it boasts a bevy of detail I would not typically reveal online, even in my instagram posts or elsewhere. It was so much fun answering and I would love for you to check it out here. So last Saturday I came back from a rather disappointing visit to a relatively new café, and needed a fresh pick-me-up in the sweltering heat. But the heat also means light, and I’ve found great solace in my mornings alone journalling, the light yellowing the pages, coming and leaving of its own accord. As it appears, flowers still grow in the dessert. This recipe was borne out of angry determination; I oft find myself thinking about veganism and how it should be made approachable or the norm to more people around me, and figured introducing classic favourites is the way to go. Who in their right mind would refuse a good, gooey brownie? Forget about it being ethical or healthy or whatnot, it tastes good, right? Food opinions are volatile, changed by taste alone. The line between veganism and sin-like lusciousness and satisfaction must be blurred. I never wanted to go vegan for the longest time because my idea of vegan food was worms and cardboard. That’s what some vegan cakes really taste like, anyway. But this is never always the case. Surprise yourself, and surprise others. Simply put, the highlight of anyone’s day. The theme is approachability, guys. This is the sin everyone is looking for in an acceptable form. Double chocolate brownie waffles studded with chocolate, crisp-edged with a tender, gooey middle. It’s not just a one-bowl wonder, it’s a time-saving wonder. If you’re like me and typically have to rush off to work by 8.30am in the morning, simply make the batter in less than 5 minutes the night before, let rest in the fridge overnight and scoop out batter for the waffle-maker the next morning. You could even just bake these for fudge brownie cookies in a 180C oven for 10 minutes. I say that like I actually did it, but do tell me if they work, because I can’t be the only one to have fun while making some (necessary) mistakes, right? The batter is like unexpected cash, you can do way more with it than you might initially think. For example, I made a fudge brownie waffle sundae by sandwiching two waffle bits with coconut ice cream (I love Luna and Larry’s!) and drizzling it with some chocolate sauce, which I made just by mixing some cocoa powder, icing sugar and almond milk together. How wonderful is experimentation. How life-giving and meditative. 1 large mashed banana (125g), or two small mashed ones. Alternatively, you could use the same weight of applesauce. Simply put all ingredients in a bowl and mix until everything comes together. Turn your waffle-maker on and let it heat up according to its instruction manual. Grease it well! Take a heaped tablespoonful of the chocolate batter and put it in the centre of your waffle maker and let cook on a medium-high heat for at least 5 minutes. This is important in making sure your waffles turn out as crisp as possible, You can check after 3 minutes– if the waffles still feel soft to touch then leave it for another few minutes. Separate your waffles with paper towels to absorb any condensation. You can freeze these waffles for future consumption or leave at room temperature in an airtight container for 1-2 days. If eating the next day and the waffles are left out on the counter, toast them for those crisp edges once more; they would’ve softened within the day. If you’re making a waffle sundae (as pictured above), simply sandwich two waffles or waffle halves with some dairy-free ice cream and drizzle with some chocolate sauce. I did this by mixing a heaped teaspoon of cocoa powder, 3 heaped tablespoons of icing sugar and a couple teaspoons of almond milk. Play around until you get a relatively thick, dribbling consistency. Yeah. you heard right. And yes, it works. – I don’t have a proper belgian waffle maker. There. I said it. So how on earth was I to recreate some glorious dish without the proper instrument? I live with Child No. 1, who’s Swedish (Sevren), thin, with scalloped edges. It’s not the same (on the point that I don’t have a belgian waffle maker.. yeah, something must change). – Secondly, I always have a problem with timing… and storage. I was worried about how well these would freeze and toast up, and how long it would take for the same crisp factor to be achieved in a very different waffle maker. – Third… okay fine, it’s just two. I obtained the desirable crunch factor on my third waffle… By accident (above picture). Third try. During the first two tries, I got some lovely crisp ones, but they were thick and still a little dense in the middle. It was only on my third go, with hardly any batter left, that I realised that the trick to The Rich Crisp, if you’re using this waffle maker, is to use less than half a cup of batter, so that there are still holes and gaps are pouring into the mold. 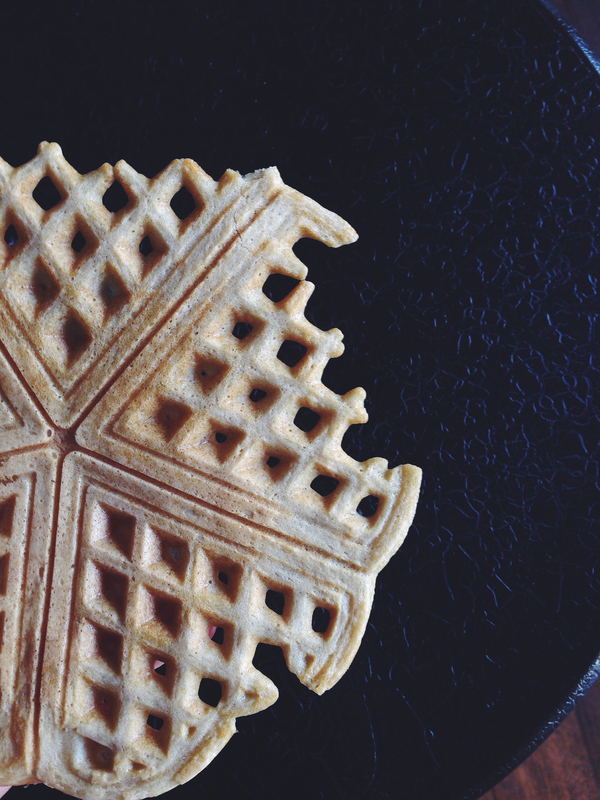 It’s only this way that the entire waffle can get nice, dark and crisp. They are light, slightly tender in the middle, and the edges are thin enough to break off like gingersnap. The magic lies in all that butter and soda water, providing tenderness and lift respectively. The base batter itself is plain and versatile, so go crazy with the toppings in the morning. Preheat your waffle iron according to the manufacturer’s instructions. In a large bowl, whisk together the dry ingredients– flour, leavening agents, salt and sugar. Add the egg, milk, vanilla extract, melted butter and lastly, the soda water. Cook in the preheated iron according to the iron’s instructions. In my Sevren waffle maker, it took 4-5 minutes before the edges went crisp and golden. These freeze wonderfully. 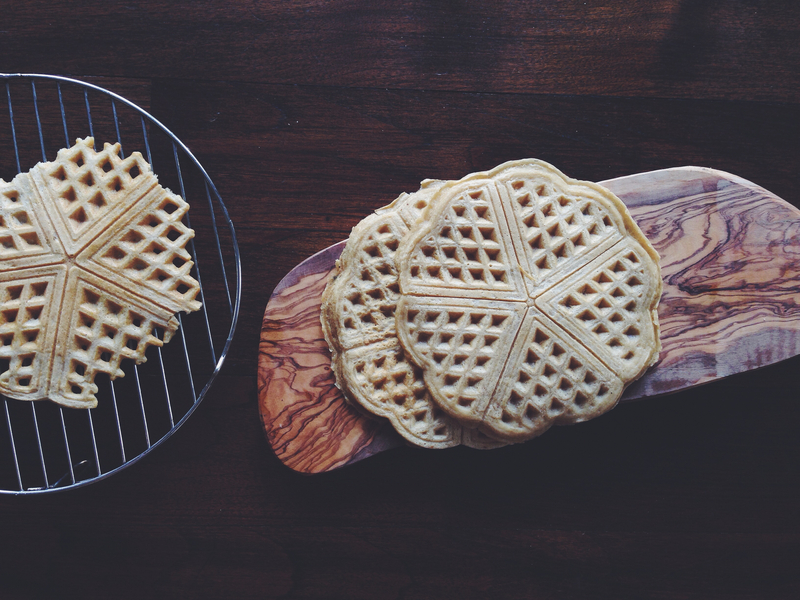 Let the waffles cool on a cooling rack, before layering them with pieces of parchment between each waffle so they don’t stick together when you take them out the next morning. The next morning, take them out, microwave for 20 seconds, then stick in the toaster until golden and crisp again. Treat the little fellas like toast and have a b.a.l.l.